It's been about a week since a friend from Vanderbilt (who I have not seen since Freshman year!) texted me a photo of the House Beautiful spread. I was totally caught off guard since I had not been expecting the issue to come out until the end of August and had not even seen a preview of the spread. I knew of course that there was a possibility of #launderinginthelapofluxury being in the issue but I was hesitant to believe it until I actually saw it. BUT THERE IT WAS! The SF Decorator Showcase (http://decoratorshowcase.org/) is such an amazing organization and charity - not to mention, great exposure for designers. Because it is so renown in our area I knew that there would be some sort of local press involvement but never in my wildest dreams did I imagine that the room would be featured in House Beautiful - a top favorite magazine of mine! It truly is a #designerdream come true. So incredibly grateful that the Design Advisory Board saw through my black and white rendering to select my design for submission and equally grateful to all those that supported the cause with their time and monetary contributions. I never could have done this without Sam Diosdado of Sidney Construction, Julie Lloyd of Clive Christiansen, Stephanie Kaslow, Chroma Colors, Kohler, de Gournay, WCD, Ferguson, Soane, Artistic Tile, Country Floors, Biro & Sons, Orellano Fabrication, New Marble, Jessie Black, Anthem, Barbaraz Embroidery, Lee Jofa, Kneedler Fauchere, Villa Verde, Waterworks, Jenny Bittner, Kim Gonthier and Lisa Davis PR, and my friends and family who had to listen about showcase for months on end. Almost always when I begin a new project and need some inspiration I find myself perusing the website of Bunny Williams. Before starting her own firm in 1988, Bunny learned from the best in the business- having worked for Parish- Hadley Associates for 22 years before venturing out on her own. Bunny is the master of creating spaces that are actually livable. Although she was schooled in "the classics, restraint and appropriateness" all of which "are hallmarks of Bunny's style" NEVER is a coffee tables too far away from the sofa, and never does a seat not have a place to rest a drink. She truly takes the time to think HOW someone will be utilizing the space and how to make it realistic in use. As a designer who works mainly on primary homes this is something my clients always stress- wanting a home that is comfortable. Bunny has been expanding her interior design empire. I was sad to learn that Treillage on the Upper East Side closed but a woman can't do it all! and Bunny has several books, a furniture line, a fabric collab with Lee Jofa, and clients all over the world. No idea how she does it all but I am glad she does as I source from her quite often. Check out Bunny's work below - always original, always classic, always timeless. Truly obsessed with the overall feel of this kitchen nook! I've got a major #WCW on Katie Ridder, who is known to grace the Top 100 List of all my favorite publications- House beautiful, Elle Decor, NY Magazine to name a few. Her style is so distinctive - fusing color, culture, texture, time periods, materials, - she is the ultimate master of the Mix! Furthermore, her custom pieces are layered with detail upon detail - she has a meticulous eye for it! Sometimes I carefully study her work to try to extrapolate all the layers she uses and am overwhelmed by how many different resources she uses to create one piece- that's why each piece she crafts is so unique and in turn, each project so different from the other and equally bespoke. Additionally, Katie has developed an amazing textile/wallpaper line. I have yet to meet a client who has not fallen in love with her "Turtle Bay", just goes to show that despite having a unique flair she is incredibly universal. Love the bold and beautiful color in this New York City Apartment breakfast nook - the high gloss walls and the leafed ceiling..Ah-Maze! devil in the details. Leather + Trim + Nailhead! Love the incorporation of the jewelry on this art wall! My best friend from college is getting married this September in Tuscany, but before she gets hitched we are all meeting in Charleston to celebrate her bachelorette. Having never been to Charleston I am very excited to visit this quaint town that I have heard nothing but rave reviews about. While there is plenty to do in Charleston such as, experience the Neoclassical architecture that abounds, eat at the many world renowned restaurants, wander through some of the country's oldest gardens, and shop along King Street, I am very excited to check out the Spectator Hotel. Currently listed as the number one hotel in the US it is conveniently located between Charleston's French Quarter and the Market Street Districts. A very boutique hotel- there are only 41 rooms, the hotel exudes roaring 20's throughout and its charm and lux can be fully credited to lead designer Jenny Keenan. You have to try one of the signature craft, southern flair cocktails! "Southern hospitality mandates that there are no strangers here"
Can't get enough of this amazing view! What to do in Charleston? I mentioned in yesterday's post that Kips Bay Showhouse announced it's list of designers at the gala Monday night and I was thrilled to see that San Francisco's very own Ken Fulk will be participating. One of the hottest designers in San Francisco, Ken Fulk does it all - from commercial to residential spaces, weddings, events, and furniture. Ken is best known for his creative and dramatic spaces all furnished in a combination of antique, vintage pieces, modern art, and always complete with a touch of taxidermy. The best appointed restaurant's in San Francisco all bear Fulk's touch - Leo's Oyster Bar, Marlowe, and of course The Battery, to name a few. For these reasons, Mr. Fulk is my man crush this Wednesday and I am anxiously anticipating what he does at Kips Bay! - off to purchase my flights before I forget but just a sampling of Fulk's brilliance below! Located inside Hotel Zetta, The Cavalier is a fabulous British themed gasto pub- see all the taxidermy! The bar feels just so 1940's - cruise ship almost! It has been a little over two years since I made my west coast return after spending half a decade away in NYC. As I spent my day yesterday deciding when the best time to plan a visit would be (obviously not right now, this state of emergency is completely unappealing) June or July, or wait until September/October I realized that by the time I get back to New York it will have been a full year since my last visit. After much contemplation, and yesterday's announcement of the 2017 Kips Bay Showhouse designers, I've made a decision that June it is. I loved New York while living there and still do, but for the last year or so I have just had little urge to make the 6 hour flight over...but absence makes the heart grow fonder and I'm definitely counting down already (although no flights have officially been purchased). New York is the mecca of interior design as I've mentioned before, and while not the ultimate city for hotel lusting (other cities in Europe take that prize), there are more than a handful that are not to be missed and admired. One of my favorite hotels of all time is the Gramercy Park Hotel. I love the GPH so much that when I was scouting a new apartment years ago I limited myself to the prestigious address of Gramercy Park so that I could be a stones throw away from the hotel and its famed Rose Bar - never did I devour a lychee martini more quickly. The hotel originally opened in 1925 and was sold to Ian Schrager in 2003 who collaborated with artist Julian Schnabel to transform the hotel into the luxury and art hot spot it is today. Although Schrager no longer has any affiliation with the hotel he was the mastermind in creating this boutique gem. For those who have yet to witness GPH for themselves, it is an absolute must and for those who have, it is always a treat to return. It should come as no surprise that I find the opening of de Gournay in San Francisco most exciting. I have been enchanted by their hand painted product since I first spotted them years ago and the fantasy of enveloping my future home from floor to ceiling with their magical papers is a fantasy that continues to persist. 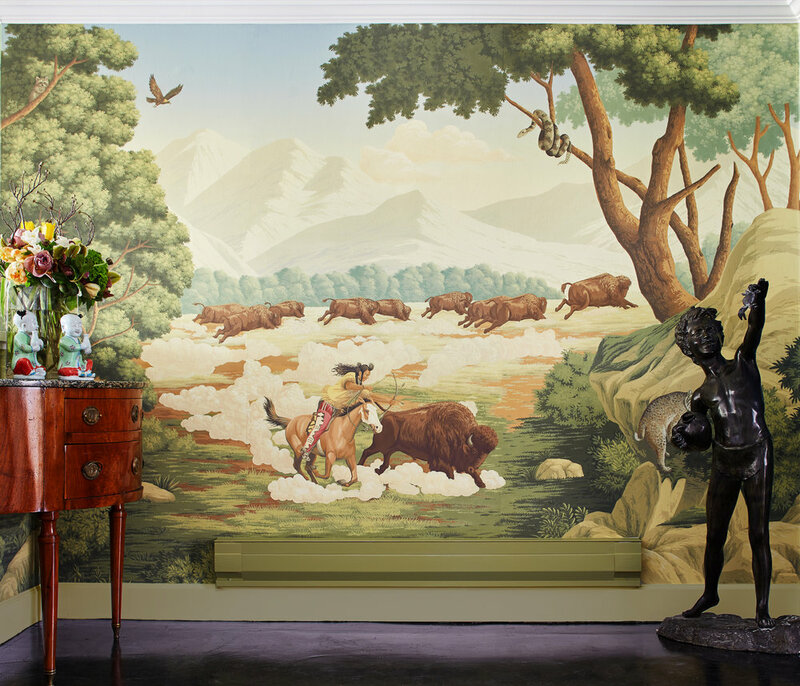 Last year, when designing for SF Showcase, I absolutely knew that de Gournay had to be incorporated into the design (and it was! we used the "Monkey" wallpaper). This year, when developing my design for the laundry room for SF Showcase I reached out yet again to de Gournay to partner up, this time completely enamored with their new design "Thousand Li". The opening party was last Wednesday and it was quite the society and design soiree. The new gallery is on Sacramento Street and is as charming from the outside as it is beautiful on the inside – complete with a quaint garden through the back. Even if these wall-coverings may not be in the budget for everyone, the new shop is an absolute must see for anyone who considers themselves a true aesthete. Also, the shop is pup friendly and Lady Arabella (pictured below) can be seen lounging through the front door. Eye candy below (photo cred: Brad Knipstein) but really a must see in person! as toted by Haute Living- cabinetry by Clive Christian- Julie Lloyd is the best to work with! Most interior designers will tell you - they just knew they wanted to be interior designers when they grew up and I am no exception. I distinctly remember telling my mom at the age of 7 that when I grew up "I wanted to be an interior designer!" . My mother, a doctor, who followed in the path of 7 generations of doctors, and my dad, a doctor as well, from 9 generations of doctors, could not understand how I could be anything but a doctor (hence my short stint as a "lawyer"). So they scoffed at the idea of me becoming an interior designer. In college I did not study anything related to interior design and it was not until I graduated from college that I realized I still really wanted to be an interior designer. I figured now was a time as good as ever to pursue my real passion and it was then that I started obsessing over interior designers, absorbing everything I could from their websites and design books, and developing major #womancrushes on the designers I admired most. My crushes are constantly changing but Kelly Wearstler was my first true design crush. Her style is so bold, so unique, so innovative - it never ceases to puzzle me HOW she comes up with what she does. My style is definitely less bold than Kelly's but I always appreciate and admire each of her projects. Black & White Done Right! For my most recent birthday my darling boyfriend wanted to indulge me in a beach vacation. With his crazy work schedule time was not in our favor so finding a destination with minimal travel was a must. I had been dying to go to Tulum and with a red eye as a flight option it turned out to be the perfect destination for our schedules. With Tulum being such a hot spot these days our hotel selection was somewhat limited (Tulum hotels have approximately 20 rooms per hotel so the most coveted ones book up WAY in advance). My Miami bestie had just returned (engaged!) from Tulum and had stayed at Mi Amore and highly suggested it. We booked blindly based on her rave reviews and did not realize our hotel lacked beach access until it was too late to find an alternative. A major beach fanatic I was disappointed, but this disappointment only lasted until we arrived at Mi Amore and saw firsthand what a gem our hotel was. Mi Amore is nestled upon the rocks overlooking the ocean and the views and grounds are superb. The staff was so attentive and the complimentary breakfast every morning was our favorite. Mi Amore has several sister hotels one which was two minutes walking distance (Mezzanine) and had prime beach access so our beach situation was a complete non-issue. We spent another day at a different sister hotel- Le Zebra- and had the best mojitos, not to be missed! Tulum in general is miles of sandy white beaches and turquoise water that I had only seen before in the Bahamas. The restaurant scene is incredible with every meal being better than the next. Each evening we would venture into town for drinks and dinner - (a ten minute cab ride from Mi Amore). The spots we checked out included Chef's Table (an intimate dinner for a group of 10), Posada Margherita (Italian cuisine beach side), and Arka (more of a Miami vibe)- each noteworthy and highly recommended. As for architecture! – The Mayan ruins, which are walking distance from Mi Amore, are due a visit. Besides mind blowing that these were built in the 13th century and still stand (somewhat) today the views are incredible - similar to Mi Amore but even better. For those of you who have yet to make it to Tulum, I highly suggest it - eye candy below. We stayed for 4 nights and managed to do almost everything we wanted (besides Stand up Paddle Boarding) but are already planning our next visit. Two years ago when I was contemplating moving back to San Francisco or staying in New York City I realized my decision really needed to be based on where I saw myself building my business and my brand. NYC in my humble opinion is the mecca of the design industry and as grateful and fortunate that I am to have started my design career under the wing of Katie Leede, I knew I needed a change. LA was also an option but my fear of getting stuck on the 405, in traffic, and needing to go to the bathroom, really deterred any permanent relocation. In the end I decided for a West Coast return. I felt strongly that San Francisco was still developing as a design destination and that as a young beginning designer I would have a decent amount of opportunity + the benefit of my family and childhood friends to support me on my venture. With the recent openings of several more fashion forward stores (Intermix, finally! ), Reformation, and more importantly design showrooms such as de Gournay and the Rug Company, I can confidently say, I was on to something. While San Francisco is not quite yet the fashion or design destination that other cities around the world may be I certainly do think it is setting itself up to become a contender. I had the pleasure of spending a long morning at the recently opened The Rug Company and was enamored by the beautiful showroom. The showroom was designed by The Rug Company's internal design team based in London with the help of architect Steve Geiszler and contractor's Matarozzi Pelsinger Builders. The team did a beautiful job and the team working there, comprised of Jessica Herzog and my former rep at Lee Jofa, Marcie, are friendly, hospitable, and very clearly happy to be representing such a fabulous brand in such a beautiful setting. The building itself - 722 Montgomery St. has a unique history as it was vacant for many years. A historic landmark famed as the former office space of Marvin Belli, the infamous SF attorney who was known for disturbing the peace when he would light a canon off the roof after each victory. His 6th wife inherited the property after he passed away and the building was vacant after the 1989 earthquake due to all the damage. 30 years later it was finally restored and now as of May 2016 home to my faved – The Rug Company. A few professional eye candy images below (photo cred to EdRitger|Photographer and then a few i-phone snapshots of a few rugs that I am dying to purchase for myself and OR! for clients! Understated Elegance, cannot go wrong. I spent a summer in London before my senior year of college and tested my parents on their offer- visiting 13 cities in 8 weeks. As an interior designer traveling the world, visiting museums, embracing the architecture of ancient cities, and indulging in hotel interiors goes beyond a "vacation". I truly find it essential to my betterment as a designer. Good design is so much based on scale and the harmonious composition of one item with the next, one fabric with another, etc... which may require an innate understanding but also requires a training of the eyes which can be done through seeing and absorbing. To me traveling and exploring is an education in it of itself and so every opportunity to travel I seize without hesitation. Europe is one of my favorite destinations (I was actually born in Europe - St. Petersburg before the collapse of the U.S.S.R) and am thrilled to be returning to Italy this September for my best friend's wedding. In searching for hotels to stay in Tuscany the Rosewood Castiglion del Bosco came highly recommended. The hotel was recently renovated so there is no doubt it is in pristine condition, but I never want to sacrifice old world charm for modern luxuries. I should have known, as the estate was founded by Massimo Ferragamo, the chairman of leather fashion brand Ferragamo USA., that this 800 year old wine estate was only enhanced by the renovations. I once asked Katie Leede, my first interior boss lady, how she became so good at what she does - how she knew all the details she did, and how she constantly was able to pull ideas out of thin air, each one better than the next. Katie, who technically did not have any formal training in interior design (goes to show born with talent supersedes what you can learn) replied simply- I study all the best. She picked up a design book, opened it up to a random page and walked me through what her eyes saw. She pointed out the turkish corner the designer used on the sofa pillows, the bullion fringe that enveloped the sofa, a coffee table that clearly had been hand carved, and went on and on and on, pointing out such intricate details that my inexperienced eye never would have really noticed. I learned a lot working for Katie, but this lesson to learn from others by carefully studying their work really resonated. My home is overflowing with design books and I never miss a chance to open up a book and dissect what I see in front of me. Every intern/ assistant designer I have trained, I have taught to do the same. I stress to them the importance of learning from other designers. Seeing what you like and DON'T like and really paying attention to the minutia. It is this lesson I learned from Katie that inspired me to dedicate an entire day (Wednesday's) to my Women and Men interior designer crush's. And, it is only appropriate that the first goes to Katie Leede of Katie Leede Studio (formerly Digs by Katie). A total sucker for powder rooms, I was quickly enamored with this one- from the vintage textiles, to the creative custom paint job, and of course the one of a kind vanity - There is just so much in this 5 x7 space to drool over. A vignette from Katie's bedroom at the Hampton's Showhouse 2012 - I love this image because it captures Katie's talent to mix and match and layer upon layer to create rich rooms. Especially noteworthy is the hand embroidered panel draped against the chair - from Katie's "Maharaja" collection.